Linda Collins | Greene County News Representatives from the Ohio EPA Divison of Surface Water anwsered questions and heard comments from concerned Bath Township citizens. BATH TOWNSHIP — Many opponents and a single supporter of the proposed upgrades to a local biosolids digester facility provided testimony before the Ohio Environmental Protection Agency (EPA) March 22 during a two-hour public hearing. 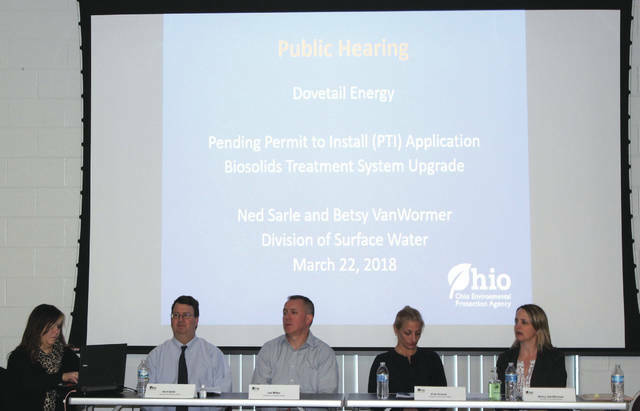 The hearing was part of a process to collect public comment before the state agency evaluates the Permit to Install (PTI) application to upgrade the Dovetail Energy LLC Biosolids Treatment Facility, 1146 Herr Road in the township, from a Class B biosolids system to a Class A, Exceptional Quality biosolids facility. Dave Anderson, who resides on Byron Road, asked EPA officials if any lawsuits were ever filed against Dovetail Energy LLC for any EPA violations. EPA Representative Betsy VanWormer said she was not aware of any lawsuits. However, the Ohio EPA did fine the company $2,500 in March 2014 for commencing with the construction of the facility prior to the issuance of the PTI, a violation of Ohio Revised Code Chapter 6111 and Ohio Administrative Rule 3745-42-02. Nancy Clevenger, who lives on Ohio State Route 235, expressed her concerns about the possible impact that blasting at a nearby rock quarry could have on a 5-million gallon lagoon that holds remaining biosolids after the digestion process. She also asked why the Ohio EPA did not routinely conduct on-site inspections of the facility without prior notice. EPA Representative Ned Sarle told Clevenger that EPA officials inspect the facility when they receive complaints, and VanWormer noted that she recently paid a visited to the facility without giving the company prior notice. Stefan Yackowsky, who resides on Byron Road, said he feared that the proposed upgrades to the facility would increase the noise levels, which already disturbs many residents’ sleep. However, Heather Lauer, Ohio EPA public information officer, told residents that noise pollution does not fall under the Ohio environmental laws and noted that the problem was a local issue. One local farmer discussed the issue of runoff from the company’s land application of the biosolids that he said comes very close to his drinking well. In April 2017, the Ohio EPA Division of Surface Water received a report that runoff of biosolids that were spread on nearby farmland ran onto private property located along Herr Road. After an EPA inspection revealed a violation, Dovetail Energy took corrective action to abate the violation. Kassie Lester, who lives on Herr Road, asked EPA officials how they deemed the facility agricultural or industrial. Sarle stated that the EPA classifies the operations as industrial. Lester asked why the Ohio EPA permitted an industrial facility on land that is zoned agriculture. Sarle replied that the EPA does not get involved with zoning issues. Carolyn Darner, who also resides on Herr Road, expressed her discontent with the fact that her family must abide by strict zoning regulations, but the EPA does not. EPA Representative Erin Sherer became involved in a heated discussion with several citizens after township resident Benjamin Jones Jr. asked why the Ohio EPA made a decision not to conduct a public hearing before approving the original permit to install in 2014. Jones also referred to a letter that Quasar Energy, the company that built the local biosolids digester, sent to the Ohio EPA in July 2013, which stated that Quasar Energy opposed a public hearing and requested that the proposed permit be finalized. Fourteen citizens took to the podium during the official on-the-record hearing to give testimonies. Additional complaints ranged from the lack of safety barriers and a retention area around the lagoon, bright lights shining from the facility at night, possible contamination of residents’ drinking water, heavy truck traffic and the spreading of biosolids near Hebble Creek where a large amount of fish have died. Brenner Campbell, who has resided on Herr Road for one year, told EPA officials that he did not like the fact that biosolids are being spread on farmland adjacent to the yard where his four small children play. However, Dave Linkharg, an eighth-generation farmer in Greene County, told EPA officials that he had been using biosolids on his farmland for years including biosolids from the Dovetail Energy facility. https://www.fairborndailyherald.com/wp-content/uploads/sites/50/2018/03/web1_epahearingbathtwp.jpgLinda Collins | Greene County News Representatives from the Ohio EPA Divison of Surface Water anwsered questions and heard comments from concerned Bath Township citizens.